I’ve attended a few conventions and tradeshows in my lifetime and I have to admit, as a first time Dreamforce attendee, I was quite impressed and at times overwhelmed. Having evolved over the last twelve years, Dreamforce is less of a convention and more of a San Fran cultural event that is probably less anticipated by local residents and more so by businesses for obvious reasons. My week started by arriving on Monday evening and being greeted by a super friendly cabbie who immediately knew why I was visiting. He was quite knowledgeable about Dreamforce and was able to give me some good advice about navigating the city and what to avoid. He also admitted that Dreamforce had evolved from humble beginnings to the festivity it’s become today and how it’s a serious contributor to San Francisco’s economy. That evening, I spend a few hours going over my agenda and meetings for the week and became acquainted with the Dreamforce mobile app that neatly and intuitively laid out my week broken out by each hour of each day and a map of each location. While familiarizing myself with the map, I quickly realized that Dreamforce had taken over the entire northeast quadrant of the city with events in dozens of hotels, open fields, theaters, and the famous Mascone Convention Complex. However, all the glamour aside, I really looked forward to the event with focus on gaining a better grasp of all the products as well as some specific areas such as app development, AI, IoT, and Analytics. To be able to see all this in action, I turned to sessions and demos that were customer success focused. One of the most interesting such sessions was themed, “The City of the Future”. One of the presenters was the mayor of Town of Cary. With a population of 160k or so, Cary is located near Raleigh-Durham and is surprisingly hi-tech. Leveraging Salesforce the town offers most of its citizen-services such as DMV, trash pick-up, and yes, reserving a public tennis court, through a sophisticated, yet simple interface built on the Salesforce platform. This was demonstrated using the Siri-like Einstein Voice (although through the partnership with Apple, I suspect it’s built on Siri) using simple human-like requests such as, “Hi, I’m new to the city and need to start trash service”; the app then asked a few customer information questions, created a case, and scheduled a drop-off of a trash bin, even placing the appointment in the phone’s calendar. The solution also leverages AI, IoT, and Analytics to analyze and send viable traffic information from city cameras to Wayz helping drivers avoid traffic! Another similar innovative solution that got my attention was demonstrated by a company that uses AI-as-a-Service to automate repetitive, high-volume tasks within the organization to include back office support, service desk, and data migrations. For instance, for technical support, employees can use another Siri-like service called Shai to open a service tickets and receive status throughout the ticket lifecycle. Another utilization included automated employee onboarding and all the associated activities. I’m a firm believer that innovation starts with our own company culture and found it refreshing that companies invest in innovations from within to not only attract talent, but to remove painstakingly tedious impediments so that their employees can be more productive and innovative for their customers. Quite frankly, that was my main attraction to ActioNet. Throughout the event, I picked up on two themes that were repeated throughout the week. One was “The Fourth Industrial Revolution” aka Industry 4.0, which was described as the era of “Connection” in this context, and the other a heightened focus on “Customer Journey”. 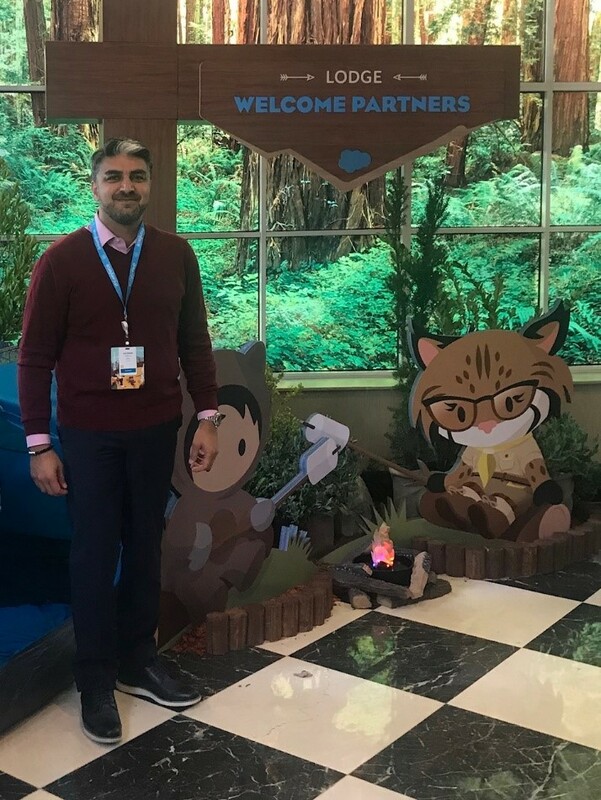 Salesforce and its partners did a great job demonstrating the connection among various Salesforce products and how they all came together to make the customer experience as enjoyable, intuitive, and simple as possible. The most notable demo was of the famous Italian designer’s eCommerce site Brunello Cucinelli during Marc Benioff’s keynote, demonstrated by Parker Harris, Salesforce’s Co-Founder. He used an app to quickly place an order on-line, and moments later decided to change his order to a jacket of a different color. He was able to quickly invoke a chat room and make the change with a few words. Through seamless back end connections of various data sources and products, the rep knew who he was, his order history, inventory availabilities, and all his customer information. Through analytics, it also keeps track of all Parker’s buying habits, makes recommendations, and sends targeted notifications of new products and sales. As someone who lives and breathes on-line, I was truly wowed by the simplicity and speed of it. After 19 sessions and as many meetings and discussions, it was finally Friday afternoon and I was exhausted from super long days and over 60,000 steps my iPhone registered in just 4 days. It was time to focus on Napa’s tranquility, beautiful sceneries, and yes, good wine and take a break from all the noise, crowds, and tech talk. But all joking aside, I was infected with a higher desire for innovation and left more inspired to help our customers. As someone who has a keen interest in Human Centered Design, what stuck with me the most was the repeated emphasis on “Customer Journey” which seemed to be infused in the Salesforce culture, products, and even many partners I met.